Regular visitors to iPad Academy know I’m a great admirer of Dan Wassink and his Noteboom site. Dan and I share a passion for helping others learn to use Apple technology. 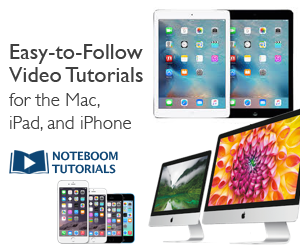 Noteboom offers hundreds of tips, tutorials and videos for Apple applications and Apple devices. Big news! Dan will now author guest posts on iPad Academy. He’ll be sharing the wisdom and experience he’s gained from developing hundreds of tutorials for the iPad and iPhone. You’ll get sound advice from one of the most knowledgeable Apple pros out there. Drop by iPad Academy regularly to take advantage of these free tips and tutorials. If you like Dan’s article, follow the link in his post. You’ll find terrific offers to get access to over 2000 easy-to-follow video tutorials. Perhaps you’ll sign up for one of his low-cost plans. If you do, I’ll get a small commission (pizza or beer money, not both). You’ll get valuable lessons from a master teacher of Apple technology. Enjoy Dan’s articles here on iPad Academy! Here’s the first.